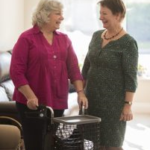 In the news this week there have been many articles about couples being separated when one has needed to go into a care home and the other does not require the same level of care. Sir James Munby, president of the family division of the High Court, called it ‘absolutely shocking and a profound indictment of our society’ that older couples wanting to stay together are sometimes not able to. Sir James went on to say that he believes that people can sometimes die from a ‘broken heart’ when separated from a lifelong companion. Live-in care can be the solution to this distressing situation. Our services mean that a couple can live together with one or both of them receiving care, and being able to keep much loved pets with them too. All in the familiar surroundings of home. Please spread the word about the virtues of live-in care!